The ever-reliable Air Jordan 13 is set to hit the market again this Friday, but this time it will come with colours that are more appealing because of its that are softer than the previous editions of one of the famous Jordan shoes. 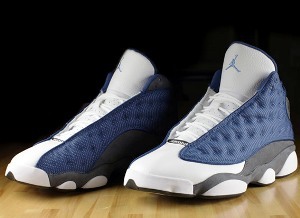 The French Blue/University Blue-Flint Grey colourway is set to hit the market and it is expected to be another bang for the Jordan lovers. Aside from its appearance, the new Air Jordan 13 retro feels comfortable especially while playing because it delivers on-court performance better than the previous releases of these shoes. With the combination of looks and reliability, the new Air Jordan 13 should not be missed, so what are you waiting for, grab one this Friday 26 November and you will get your money’s worth.